TURFFONTEIN (AUS) (Chestnut 2004-Stud 2010). 5 wins-1 at 2, MVRC William Reid S., Gr.1. Sire of 198 rnrs, 107 wnrs, inc. SW Fontiton (MRC Blue Diamond Prelude (f), Gr.2), Fontein Ruby, Widgee Turf, Lyuba, Bold Thruster, SP Turfane and of Mandela Effect, Turf Man, Fontein Lad, Faint Blaze, Finke, Safariann, Give Us a Go, Hunters Grace, Turf Crusher, Eskdale Girl, Crown Fontein, Meet Mr Taylor, Central Pass, Constantine, Double Superlative, etc. Al Passem (g. by Al Maher). 4 wins-2 at 2-from 1100m to 1600m, A$286,900, to 2017-18, VRC Murray Cox H., MRC Keno Replay H., Bill Collins 2YO H., 2d MRC Thoroughbred Club Cup, L, 3d MVRC Bendigo Bank H., L, Sale Cup, L, MRC Le Pine Funerals H., VRC Melbourne's Own 3AW H.
Rubycue (f. by Al Maher). Winner at 1350m, 3d ATC Shop With the TAB App H.
Pantera Nera (g. by Turffontein). Winner. See below. Marie Madeleine (Redoute's Choice). Placed at 2 & 3, A$195,900, 2d SAJC Magic Millions Adelaide 2YO Classic, Toowoomba TC Carlton Draught Trophy, MVRC City of Moonee Valley H., BTC Volktek Switches 2YO H., 3d MRC Blue Diamond Prelude (f), Gr.3, GCTC Magic Millions 2YO Classic S., RL, MVRC St Albans S., L, MRC Debutante S., L, GCTC Glades Magic 2YO H.
Masterstroke. 4 wins at 1000m, 1400m, A$181,962, ATC Membership on Sale H., 2d ATC Happy 2nd Birthday ATC H., Jockeys Celebration Day H., Rosehill Gardens H., Rosehill Gardens Event Centre H., 3d ATC Sharp H., St Johns Park Bowling Club H., Royal Randwick H., Tenpin City H., Sportsyear H.
Hydrodynamic. Winner at 1600m in Aust. ABSOLUTELYFABULOUS (Langfuhr). 5 wins-2 at 2-to 1400m, A$883,625, Newcastle JC Cameron H., Gr.3, AJC Reginald Allen H., L, Eskimo Prince S., L, 2d VRC Myer Classic, Gr.1, STC Birthday Card S., Gr.3, Millie Fox S., Gr.3, 3d VRC Seppelt Salinger S., Gr.2, MRC Tristarc S., Gr.2. Producer. GRIFFON (Flying Spur). 5 wins to 1200m, A$268,380, BRC Lightning H., L, AJC Festival of Sydney H., 1100m-in track record time, 2d BRC Ascot H., L, 3d BRC QTC Cup, Gr.2, Qld Tatt's RC WJ Healy S., Gr.3, Hawkesbury RC Yalumba Cup, L.
Race Record: 5 Starts 1-1-0 A$18,410. 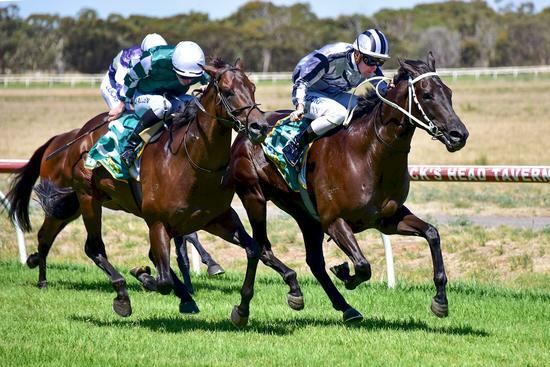 Winner at 1350m in 2018-19 in Aust.